We take pride in knowing that we walk away from our projects with very satisfied clients. Don’t take our word for it...please read what some of our clients have to say about our work. Dianne did a great job staging our home! We think it really made a difference in the sale of our home. She should thrive in her business because she does such wonderful work. we are now using her as our decorator to help us with our new home. 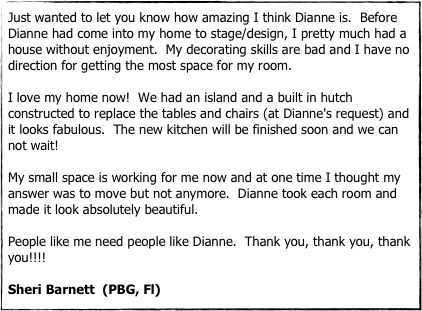 We highly recommend Dianne! Dianne has been my decorator for years . She has done everything from selecting paint colors to changing entire rooms for me. With each change the rooms take on a whole new life. She is patient ,energetic, fast, reliable and very good at everything she does.I would recommend her in a heartbeat. Dianne has made my job of selling much easier. Her creativity and imagination are incredible. She can see things in a family room that should be in the kitchen or living room and the shift can give the room new dimension without spending money on new things!! My clients have loved the easy process that she brings to the table with her patience and willingness to work with the customer to make them completely happy. Dianne has had an amazing percentage of my listings sell quickly and for a price that would not have been attained without her touches. I highly recommend a consultation and you will see for yourself the ideas that will bring you more money!!! Even if you are not selling you might need a facelift on your present home. My rating would be 5 STARS! We made the decision to redo our living room and Dianne came in at the beginning of the decision process. Her insight was very valuable to us and helped us to balance our "new look" in our 102 year old home without losing the charm. 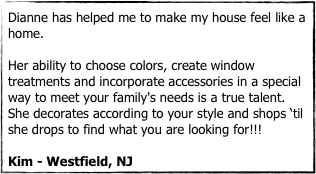 She sent me large paint samples that were perfect to choose from and helped with furniture and rug selection, as well as placement. She was wonderful to work with, very resourceful and always available. I highly recommend her to anyone considering a change, major or minor, in the look of their home. We are thrilled with our results! When I was ready to put my house on the market Dianne came into my living room full of the belongings that I was sending to two other homes and needed to decide what was to stay for staging. I was leery at first-- afraid that she'd expect me to spend a lot of money on things for the house that were not needed or even my taste. I ended up purchasing a few minimal things-- for tables settings and a a fresh set of valences for kitchen, and even borrowed a few things from Dianne . Once she helped decide what to keep in the house, pick fresh and subtle paint colors, she was able to use my own things.. just arranged in a better way. The house could not have looked better, while still feeling like our home. There was endless positive feedback from the realtors. The house was on market only several days before our good offer came in. Yes, I could have painted, cleared things out, and put the house up at the right price. I could not have gotten the results I did without Dianne's expertise. I staged for a more successful sale, but intend to now get Dianne's help in my new home for arranging furniture, wall decor and accessories.